Although Spring has been so slow in coming this year (and extremely rainy), the slightly warmer days have inspired me to get outside (when it's not raining) and give the exterior of our house a little bit of extra love. 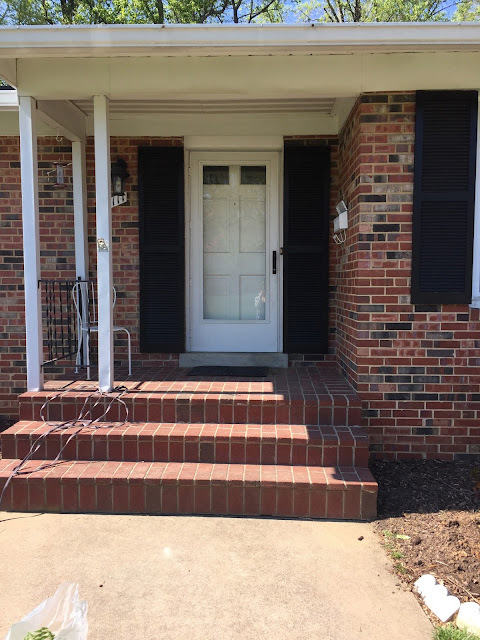 Our front porch, as well as our flower beds were looking quite sad and dismal after the long winter and they both needed some freshening up. The first thing we did was buy a few ferns to add to the front porch. And with the help of a new doormat, our porch felt a lot more welcoming afterwards. It's amazing what a little bit of greenery can do. I also decided to dig up everything in the flower bed to the right of the door and completely start from scratch. I hated the overgrown bushes and my daffodils were past their prime and resembled weeds. I removed the Hostas and re-planted them in other places. In the middle of the process of deciding what to plant in the empty flower bed, I decided the bed was too large and overwhelming, so I moved the edgers in a few feet giving me a smaller space to work with. I kept it simple with one Hosta, three Boxwoods and two Peonies. Boxwoods are classic and they will stay green year round. And Peonies are my absolute favorite flower. I've been adding one or two new Peony plants every year to the flower beds around our house and now I have six. Most of them are still so young that I don't get many buds, but a few of them have quite a few buds on them this year, so I'm excited. I can't wait to cut them and bring them inside to enjoy. I also re-planted my Daffodil bulbs so they will hopefully come back next Spring. For Mother's Day, Tim made and hung flower boxes for me. So far, I've filled them with Impatiens and Ivy. I'm hoping they grow and fill out until my boxes are overflowing with flowers and greenery. I ended up painting the front door black (it was white). As much as I love white everything, black doors are classy. I found a sweet little Gardenia bush at Trader Joes and brought it home. My mom had a Gardenia bush when I was growing up and I can still remember stopping to smell it when I was outside playing and bringing a few flowers inside to enjoy. I feel like it's quite the improvement from where we started, but I can't stop thinking about painting the brick white. Here's an idea of what that could look like. It looks so charming, doesn't it? Tim is not quite on board with this idea though, so we'll see if we actually ever do it. 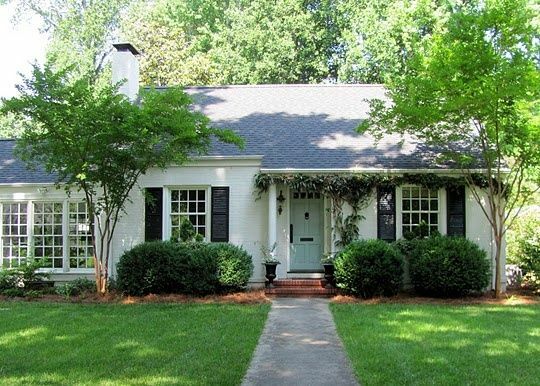 Do any of you have a painted brick house? I would love to hear about it if you do. Did you paint it yourself or have someone else paint it for you? Do you love it, hate it, or regret it? Does it require much upkeep or re-painting? FINALLY!!!!!!! I've been waiting! Love everything...now come help me!!! !